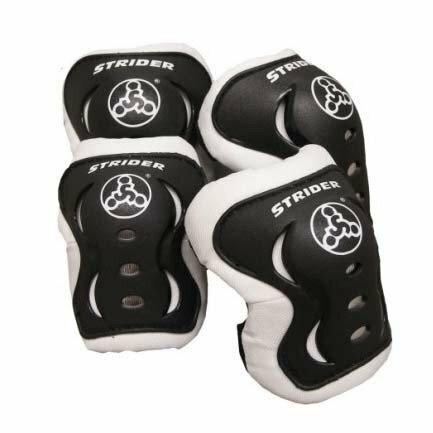 STRIDER Knee and Elbow Pad Set is a fun way to introduce safety gear to your child. Pad set fits children 2 to 5 years old. Knee and elbow pads attach easily with Velcro straps, and outer shells are made from premium hard plastic to keep the pain of hitting the ground away from little legs and arms. These pads are TOUGH. SAFETY FIRST: The knee and elbow pads are cushioned and have a hard plastic outer shell to protect those little knees and elbows. They're perfect for kids 18 months to 5 years old. EASY TO USE: The hook and loop straps make it easy for your child to gear up for their riding adventures. WASHABLE: The pads are conveniently washable for easy clean up after a muddy day of riding. Follow the manufacturer's washing instructions to maximize their lifespan. RIDE IN STYLE: Share your love for Strider with these stylish knee and elbow pads. JOIN THE STRIDER FAMILY: Strider offers a sense of community that has transformed the experience of learning to ride a bike. Strider hosts events such as Camps, Adventure Zones, and the Strider Cup. If you have any questions about this product by Strider, contact us by completing and submitting the form below. If you are looking for a specif part number, please include it with your message.